One of the stranger sights of the refugee crisis that followed the 1994 Rwandan genocide was of stretcher-bearers rushing the dying to medical tents, with men running alongside reciting Bible verses to the withering patients. The bulk of the thousands of doctors and nurses struggling to save lives – as about 40,000 people died of cholera – were volunteers for the international medical charity Médecins Sans Frontières (MSF). 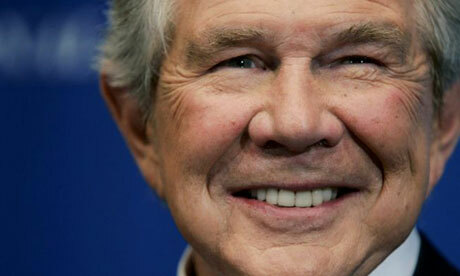 The Bible readers were hired by the American televangelist and former religious right presidential candidate, Pat Robertson, and his aid organisation, Operation Blessing International. But on Robertson's US television station, the Christian Broadcasting Network, that reality was reversed, as he raised millions of dollars from loyal followers by claiming Operation Blessing was at the forefront of the international response to the biggest refugee crisis of the decade. It's a claim he continues to make, even though an official investigation into Robertson's operation in Virginia accused him of "fraudulent and deceptive" claims when he was running an almost non-existent aid operation. "We brought the largest contingent of medicine into Goma in Zaire, at least the first and the largest," Robertson said as recently as last year on his TV station. Now a new documentary lays bare the extent of the misrepresentations of Operation Blessing's activities in the Democratic Republic of Congo, formerly Zaire, that it says continue to this day. Mission Congo, by David Turner and Lara Zizic, opens at the Toronto film festival on Friday. It describes how claims about the scale of aid to Rwandan refugees were among a number of exaggerated or false assertions about the activities of Operation Blessing which pulls in hundreds of millions of dollars a year in donations, much of it through Robertson's televangelism. They include characterising a failed large-scale farming project as a huge success, and claims about providing schools and other infrastructure.